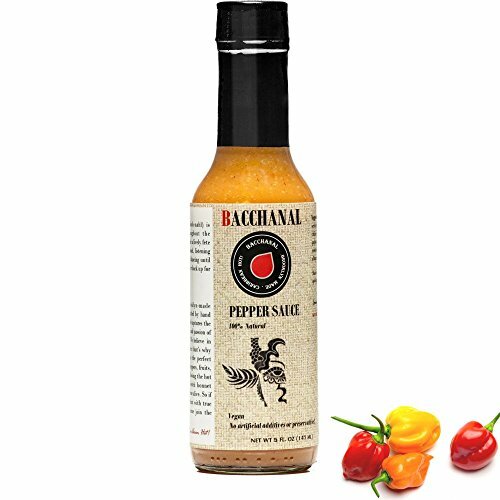 Best Hot Sauce - Bacchanal Pepper Sauce! Habanero Sauce with Scotch Bonnet Peppers and Tropical Fruit. One of a kind hot Sauce Elixir! You've never tasted Hot Sauce so delicious. Heat plus flavor has arrived with Bacchanal Pepper Sauce, Scotch Bonnet Peppers and habanero chili peppers hot sauce that brings rip roaring heat and one of a kind flavor. We don't try to be the hottest hot sauce in the world because we're about mind blowing awesome flavor with a kick! Start the party off right with the most flavorful hot sauce this side of the equator. This unique Caribbean hot pepper sauce elixir is a complex blend of scotch bonnet peppers, habanero peppers & unique tropical fruits such as pineapple, papaya, ginger and tamarind - It's the Caribbean answer to Sriracha! If you love Caribbean jerk sauce or appreciate a fruit based hot sauce but love fresh, spicy & unique this is the sauce for you. You deserve the best hot sauce. Brighten up every dish and take your hot sauce recipes next level with the perfect amount of tangy, sweet heat! Soups, sandwiches, spicy salad dressings, game night wings - it hits every mouth watering spot! Best hot sauce gift for yourself, that hot sauce connoisseur, chili head or that special someone who loves flavor & heat. Go island hopping with this awesome Caribbean hot sauce without even leaving the kitchen. Perfect as a Spicy Seasoning, marinade, dipping sauce and everyday Hot Sauce to top everything with that authentic island flavor & heat .You will receive (1) 5 Oz Bacchanal Pepper Sauce Vegan, Gluten Free & Sugar Free Versatile hot sauce for everything! Ingredients: scotch bonnet peppers, habanero chilies, cider vinegar, pineapple, papaya, onion, garlic, tamarind, mustard, ginger, lime, cayenne, allspice, cinnamon, cilantro, sea salt. Exotic Tropical fruits for sweet heat - Brooklyn Made, Caribbean Hot! If you have any questions about this product by Bacchanal Sauce, contact us by completing and submitting the form below. If you are looking for a specif part number, please include it with your message.